Watch out, eclairs. A revolution has gripped the French capital. Blame it on the religieuse pastry, two stacked, chocolate cream-filled puffs that sent me to patisserie nirvana the first week of my long-ago year in Paris. After marrying a lemon-tart-loving Frenchman and producing a daughter (vanilla macaron) and son (coffee eclair) who share my passion, I thought I had pretty much covered the gamut of French pastries. Until this past April, that is, when on a Sunday afternoon stroll with an old friend down the Rue de Rivoli, near the Louvre, I realised my guilty pleasure had emerged from the shadows and, seemingly, been embraced by le tout Paris. "C'est la folie" – "It's a madhouse!" – Agnes exclaimed when we noticed a throng of gourmands outside of Cedric Grolet's new pastry boutique. We were just around the corner from Le Meurice, the historic hotel where I once spotted actress Catherine Deneuve in the powder room and where Grolet, 33, is the award-winning head pastry chef at the Michelin two-star restaurant. "Parisians have gone crazy over patisseries," Agnes continued, "and this place is ground zero. It opened in March." We observed the uniformed doorman admitting customers, one by one, into the narrow, laboratory-like sanctum. There was no display case. Instead, as in a fine jewellery store, the goods were stored on trays under the counter, from whence the white-coated staff produced each order. Two days later, I was first in line when the boutique opened at noon. Discreet Edith Piaf melodies serenaded me as I pondered the day's five options, which included two fruit confections (simply called grapefruit and passionfruit), plus three more-traditional choices: a hazelnut tart, a pistachio riff on the doughnut-shaped, cream-filled Paris-Brest pastry, and an heirloom strawberry tart. Displayed on the snowy marble counter with five-star precision, each pastry was about the size of a softball. The man behind me, a Parisian who said he was on a "top pastry chef" quest, quickly opted for the Paris-Brest, at 10 euros. For the sake of research, I splurged on the grapefruit, at a whopping 17 euros. 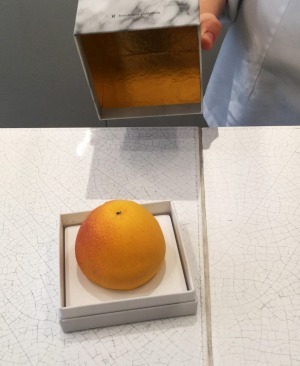 Price notwithstanding, I had a surreal "this is not a grapefruit" sensation as I watched the precious orb, which looked exactly like a ripe grapefruit, go into a box worthy of the jewellery stores on nearby Place Vendome – or of the latest iPhone. That evening, I shared it with Agnes over a glass of wine. With trepidation, I broke the flawless "peel" with my spoon. A thick layer of white chocolate ganache buttressed the delicate outer shell. Inside, a transparent grapefruit gelee held gemlike nuggets of pink grapefruit and morsels of preserved peel that flowed slowly from the casing, like glowing lava. I dipped in my spoon. Frisky, fresh, intense, chewy and creamy, the vibrant taste and crazy textures sent me to pastry nirvana for the second time in my life. I was hooked again. But this time I validated my guilty pleasure by joining the millions of followers on Grolet's Instagram feed and becoming the 40,160th person to like a post captioned, "Life is short ... let's start with dessert." According to a recent survey, one in three French people indulge in pastries once a week – it is a French culinary tradition, after all – while 58 per cent consider a good meal incomplete without a pastry dessert. "Pastries are kind of irresistible," writes sociologist and trend forecaster Ronan Chastellier, who was hired by the organisers of Paris's inaugural Pastry Show, held in June. The show, attended by more than 25,000 visitors (including me) over three days is just one example of the city's pastry obsession. Fuelled by photogenic pastry chefs on social media and cooking programs such as Top Chef, the current consumer focus on pastries is unrelenting, according to panelists I heard at the show's roundtable discussions. "Pastries are an affirmation of life, a source of comfort that harks back to childhood, and an accessible pleasure that compensates, probably, for the many little hassles of daily life," said Chastellier, who was one of the panelists. Ignited by the encounter with Grolet's grapefruit, my renewed love for these quintessential French treats called for a pastry tour de Paris. With input from French friends, family, bloggers and even famous pastry chefs I met along the way, I made my list and whittled it down to focus on a variety of atmospheres. Whether at five-star hotels where teatime includes inventive pastry menus prepared by celebrity chefs or along a street with an unusual concentration of patisseries or at modest shops thrust into the limelight by bloggers, it was a sweet way to experience perhaps the most elemental aspect of French culture: truly savouring what we eat. The haute couture of Parisian pastries is found at the historic "palace hotels" (it's an official classification, anointing the creme de la creme of five-star establishments), where ambitious pastry experts, who work alongside the restaurants' executive chefs, are redefining French pastry art for the new generation with gold-flecked and colour-swirled designer treats. Teatime, usually from 2.30pm to 6pm daily, offers a chance to sample some of the most innovative pastry art in Paris, all while recharging in the rarefied air of these landmarks. I have a soft spot for Le Bristol's romantic Cafe Antonia (conveniently located for shoppers in the heart of the Right Bank between the Champs-Elysees and the luxury fashion boutiques on Rue du Faubourg Saint-Honore) and the posh Jardin d'Hiver lounge at Hotel de Crillon (Marie Antoinette once took piano lessons in the hotel's historic salon overlooking Place de la Concorde), where pastry chefs Julien Alvarez and Pablo Gicquel, respectively, offer some of the most delicious – and interesting – teatime experiences in town. For many pastry lovers, though, a trip to Paris is incomplete without macarons. Blame it on Pierre Herme, father of the macaron renaissance. "When I began, in 1997, I had no idea the macaron would become as Parisian as the Eiffel Tower!" Herme said, speaking to a standing-room-only crowd at the Pastry Show. His newest venture, 86 Champs, is a mod cafe on the Champs-Elysees featuring an expansive macaron counter at the entrance, where you can choose from dozens of varieties. It also includes a long dessert bar, where I watched a chef assemble my pastry order. Then, I devoured the best mille-feuille cake I have ever tasted, and with the most unusual flavour, too: Herme's signature "Ispahan" rose, lychee and raspberry combo. Over the past decade, Herme has mentored many successful chefs, including Claire Damon, the publicity-shy pastry queen of cult favourite Des Gateaux et du Pain. One afternoon, I met French pastry blogger Xavier Martinage at Damon's boutique on the Rue du Bac, perhaps the tastiest destination on the Left Bank. Rue du Bac has become a magnet for sweet shops, Martinage said, as we chose our pastries from the sleek display case. Next door, the Patisserie des Reves was among the first to present fancy pastries under glass cloches, in 2009. Up the street, there is an outpost of Angelina, famous for hot chocolate and old-school pastries like the Mont Blanc. (The original is on the Rue de Rivoli.) Around the corner is the stylish Hugo & Victor, featuring pastries with plant-based colours and natural, organic ingredients. Although Martinage thinks Claire Damon's lemon tart is among the best, I prefer the version at Patisserie Nanan, a simple shop on a working-class street near Place de la Bastille, with its intense Sicilian lemon curd topped with a swish of lightly toasted meringue. Chef-owners Yukiko Sakka and Sophie Sauvage come from fine-dining backgrounds but wanted to have their own place "in a neighbourhood where we could be close to our clients," they said. 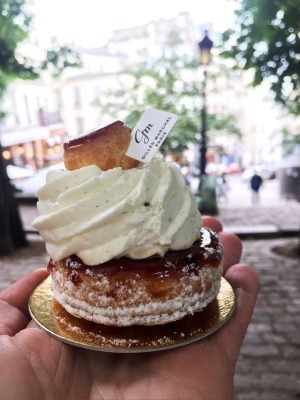 I wrapped up my Paris pastry tour on a tip from Gicquel, the Hotel de Crillon pastry chef, with a Saint Honore cake purchased from the niece of chef Gilles Marchal at his namesake – and homespun – Montmartre shop. "My uncle is usually here in the mornings," she said, when she saw me peering into the tiny baking kitchen, where burnished copper pots hung on the wall. Across the way, I spotted a worn park bench on Place Emile-Goudeau, next to the studio where Picasso painted Les Demoiselles d'Avignon in 1907. Early evening light filtered through the oak leaves and the velvety murmur of French voices rose from the cafe terrace below. I sat, plucked the caramel-glazed choux from atop the pastry and popped it into my mouth. For the record, the French phrase for guilty pleasure directly translates as "cute sin". Savouring a pastry named after Saint Honoratus – the patron saint of pastry chefs – on the Mount of Martyrs, next to a place that revolutionised the art world? Now that is a sin I can live with. This 10,000-square-foot joint "concept store" (with perfume company L'Occitane en Provence) is open from 8.30am-11.30pm daily. Food selections include a macaron takeaway counter, restaurant, dessert bar, teatime service and cocktails plus a dedicated coffee bar serving more than 16 specialty coffee drinks. Desserts from about $16. Macarons about $3 each. Generations of pastry lovers have frequented Angelina's, a Parisian classic since 1903. 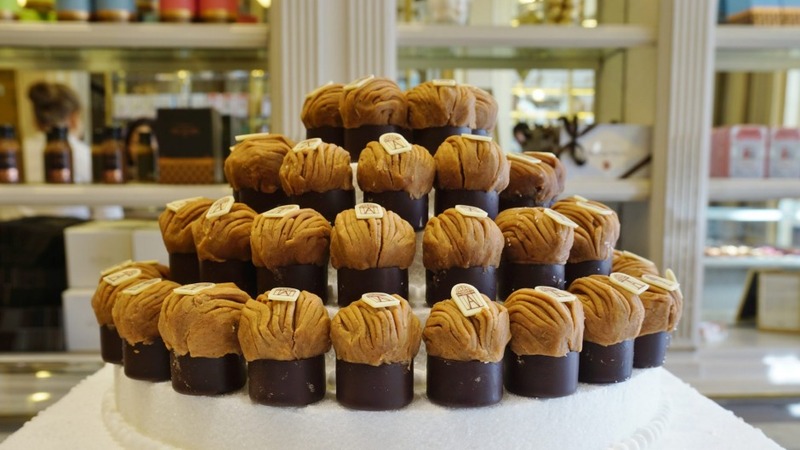 The shop on Rue du Bac offers the same pastries – such as the famous Mont Blanc (about $10.50) – as its original location on Rue de Rivoli. With a boutique that looks like a sleek, contemporary jewellery store and seasonal pastries to match, chef Claire Damon makes pastry-lover cult favourites such as J'Adore La Fraise cake (I Love Strawberry cake, about $7.40) or a fresh rhubarb cream pastry on an almond biscuit base (about $6.85). For a three-course pastry extravaganza in the stylish Jardin d'Hiver lounge, try its Teatime of the Dukes prix fixe menu, which costs about $68 per person. The location, among the Left Bank's footpath cafes, is a good spot for people-watching while enjoying a croissant (about $2) or a moist financier cake (about $2.15). If you can resist the attractive array of traditional pastries, that is. Just a few blocks from Place de la Bastille, this neighbourhood spot is staffed by the owners, who bake the delicious lemon tarts (about $5) and other pastries – including an unusually moist matcha tea cake (about $3.40) – on site.